Unlike many other countries, USA included Thailand values the contribution of the Indigenous Traditional Medicine (Thai Ayurveda/ Thai Yoga etc.) and has committed to ensuring the welfare of it’s aging population by utilizing it a health care resource. This is a big deal for any country to not only recognize it’s indigenous medicine heritage but to then incorporate it’s practice institutionally. No surprise for Thailand however, as the Thai government has been supporting traditional medicine for many years now. Traditional Thai Medicine (TTM/ ITTM) experts with various specialties from Yoga Therapy (Ryksaa Thang Nuad Phaen Boran/ Reussi Dottan) to Herbology (Prakhop Samun Praii etc. ), work in teams alongside family physician, dentist, nurses, dental nurses, a pharmacist, a public health officer, a physiotherapist and a care-giver, and local residents working as a healthcare volunteers. The traditional medical therapies include religious practices of Prayers and reciting of Sacred Mantra. Indigenous Traditional Medicine and Religious Therapeutics are the medicine for the future not just of the past. Original Article: Courtesy Bangkok Post: ©Post Publishing PCL. All Rights reserved. Sacred Sites and Healing Arts Thailand Training and eco-cultural tour. 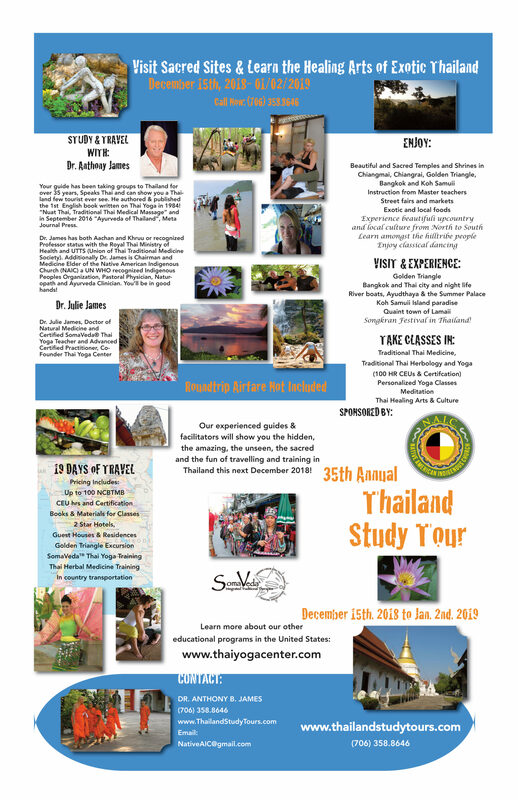 A 19 day journey to amazing Thailand to experience Ayurveda and Thai Yoga Therapy. We will travel to various beautiful locations significant to the practices of the indigenous Thai healing arts and Traditional Medicine. Thailand culture, traditional medicine, people, food and scenic land will warmly greet you. Join Dr. Anthony B. James, Aachan and Professor of Indigenous Medicine for this 35th. Annual winter externship training and tour of Thailand. Includes all Hotels (2/3 Star), Ground/ Transportation, Guides, Course work and personal guidance and teaching with Dr. James and our Thai Staff. This is no ordinary “tourist” trip! Expect to be deeply engaged with local and professional Thai Teachers, experts in the indigenous traditional natural medicine of Thailand. Trip will provide graduates with 100hr Completion Certificate. NCBTMB Categroy A Approved.